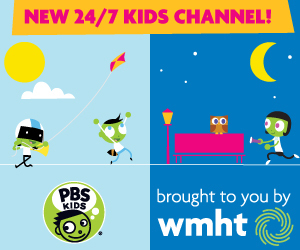 Nature Cat™is a new animated PBS KIDS® series designed to encourage kids to explore and develop connections with the natural world. With broad comedic appeal and a focus on natural sciences, the show follows Fred, a house cat who dreams of exploring the great outdoors. Once his family leaves for the day, Fred transforms into Nature Cat, "backyard explorer extraordinaire!" Nature Cat can't wait to get outside for a day of backyard nature excursions and bravery, but there's one problem: he's still a house cat with no instincts for nature! Fortunately, Nature Cat's animal friends are at his side to share in his deep love for Mother Nature, passion for exploring the great outdoors, and swashbuckling wanderlust of old-fashioned backyard adventure. It's Nature Art Day! An extremely excited Nature Cat proudly unveils his latest nature masterpiece - a statue of himself made entirely out of acorns. But there's a slight problem; the statue's acorn head is gone! Nature Cat and his pals investigate and quickly discover animal tracks, leading from the sculpture toward the woods. It's time for adventure as the gang follows the animal tracks hoping they will lead to the culprit and Nature Cat's acorn head! Tally ho! Curriculum: Animal tracks give clues about what kind of animal made them, where it was going, and what it was doing..
Heartthrob Hamster Nature Cat's family is pet-sitting their neighbor's super cute hamster, Sir Galahad. The hamster wants out of his cage, but Daisy reminds the gang that they're not allowed to let Sir Galahad out no matter what. Hal "accidentally" knocks the top off the cage, freeing Sir Galahad who immediately runs away claiming he'll never go back in the cage, ever! Uh oh! Nature Cat and his pals need to work together and use their observational powers to find Sir Galahad before their family gets home or else! Onward and yonward! Curriculum: When you need to track an animal and you can't find any tracks, follow other "signs" the animal may have left behind.